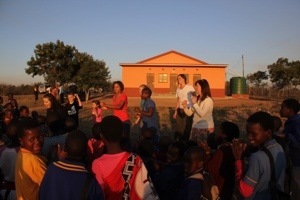 Today was a day our team and the community of Njojane won’t soon forget! This morning our team discussed how we were struck by why we, as Americans, have so much and these people so little. How is that fair? Emily, one of our team members, wrote: But what I noticed more than anything was their joy. The kids you see in the sponsor pictures look sad or serious. But if you tell them to “schlega!” they will smile so big! They are happy to be alive. The kids play well together, poke and tickle each other, chase each other, kick the soccer ball (really well), and are just kids. But they have so little. It truly amazed me how much joy they have just having their clothes, maybe shoes, and food. It makes me think – do we really have more? Having so much in the United States it is easy to be consumed with the materialism and wanting for new items, but in the end it matters none at all. We were reminded that we are all God’s children. Though impoverish materialistically, they have Him and His love. And because they rely on Him much more than many Americans who are distracted by material things, they have so much! God reminds us that His love is sufficient. “Sufficient” can be an ugly word as we sometimes equate that to meaning a minimum standard. But it’s His love, His abundance, His grace. We shouldn’t question how He cares for His children even though it may not be in the same way we would care for our own children. John 14:27 says “Peace I leave with you; my peace I give to you; I do not give it to you as the world does. Do not let your hearts be distressed or lacking in courage.” It’s with this realization that we are blessed as we learn from the people we are here to serve. This also gave us a new frame of mind as we headed to Njojane for the first time. We arrived at the Care Pointe in the morning and were welcomed by the preschool children and bomake, pronounced bo-mah-gay, the volunteer cooks at the center. Our team immediately made new friends, helped to “prepare” the 20 chickens for the afternoon’s celebration, looked for familiar faces of sponsored children, and welcomed the older children as the schools began to dismiss. 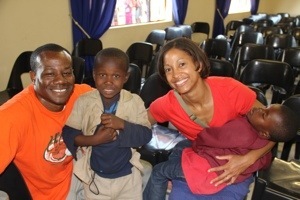 While some of the children were shy at first, we also saw a lot of happy faces. What all of the team and Njojane knew (with the exception of Lisa) was that all at the Care Pointe were getting ready for a surprise vow renewal celebration including Pastor LaSallette officiating and the high school dancers performing. 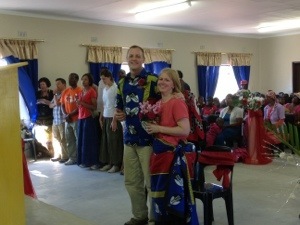 Lee and Lisa were celebrating their 20th anniversary today in Njojane! Pastor LaSallette did an amazing job of tying the event into a message for Njojane on how God intended marriage to be. This was a needed message as so many Swazi children, including our Care Pointe children, are orphaned as families don’t tend to last here. So, what does tomorrow bring? Our team will be leading Bible lessons and installing playground equipment in the morning and will be meeting with our sponsored children in the afternoon. There are so many loving kids here. We can’t stress enough that if you get the opportunity to sponsor a child, you will be blessed beyond measure! Love! How awesome! Praying for you all, the kids and the Care Pointe. Lisa and Lee that is. Love this!! Congrats guys!!! Praying for all of you! !